An influx of new library users? What might be the impact of reforms to the welfare benefits system on usage of public libraries? This is an emerging question in the UK, in the light of the Government’s introduction of Universal Credit (UC) – a system designed to simplify the complex mix of benefit payments received by claimants, but which critics argue will make many people worse off. One of the features of UC is that it can only be applied for online. Efficient to an extent, but the large proportion of the population whose digital skills are poor or non-existent, or who do not have access to the internet at home, are suddenly finding that their livelihood depends on them accessing online services which they are poorly-equipped to use. Moreover, these individuals are often drawn from the most vulnerable and less well educated sectors of the community, which heightens the problem. For them, public libraries provide an obvious source of advice as well as a venue where they can access computers to get online. There is an obvious relationship with information and digital literacy: what can be done to help claimants who have a basic and urgent need for information? Last week, I helped to facilitate a workshop organised jointly by the Tinder Foundation and CILIP’s Information Literacy Group, where one of the discussion strands was how libraries are coping with the influx of users who need to find out about UC and how to claim for it. A number of public librarians from across the UK took part, and overall, their diagnosis was not cheerful. The overall feeling was that the impact of the UC changes on public library usage has not been thought through by government. There was resentment that the Department of Work and Pensions (DWP), charged with implementing the introduction of UC, had not factored the costs of helping claimants use the new system, and consequently not made funding available for this purpose to libraries. I heard repeatedly about the expectation that, somehow, libraries would cope, in spite of users being systematically referred them by other agencies such as Job Centres. UC is being rolled out gradually across the UK, so not all parts of the country are yet affected, but we were told of one case where an extra 5,000 users a month have been reported in a single library since the introduction of UC – a possible indication of the scale of the challenge to come. And, as several participants pointed out, assisting claimants and guiding them through the UC application process can be a labour-intensive, time-consuming process, often involving one-to-one attention. Making use of volunteers came up repeatedly. This is potentially valuable for specific tasks, but problematic where volunteers do not have the right skills. Moreover, there could be ethical or reputational issues where they, rather than library staff, are used help with the inputting of confidential or sensitive information on claim forms. Another recurring idea was the need for better co-ordination between libraries and other public or charitable agencies, such as Citizen’s Advice Bureaus (CABs) and housing associations, to lessen the risk of ‘dumping’ users onto libraries. A more joined-up approach could lead to imaginative solutions and partnerships, for instance job clubs or the use of library premises by other public services. But it is important to ensure a strategic approach to co-ordination: this would best be achieved at regional or national level, rather than on a library-by-library basis. Bodies such as the Society of Chief Librarians  could be instrumental in helping to develop effective partnerships. Signposting by libraries of services and resources provided by agencies that may be better equipped to help. This include those made available by the Tinder Foundation, such as the online tutorials devised through their Learn my Way programme. Rationing of space and time in library premises, such as making computer terminals available to any given user for only for an hour or two . Targetting of clients (but on using what criteria? I would have liked to hear more about how that might be achieved). Linking the imparting of relevant information and digital literacy with work undertaken by libraries for other practical skills, such as financial literacy. Underlying all this is a debate about the mission of libraries, rendered acute by the difficulties of addressing the growing needs of benefits claimants: should librarians be helping users to fill application forms in a very hands-on way, on a case-by case basis (very labour-intensive, as I’ve suggested above, but it’s what users with immediate requirements understandably often prefer), or should they focus instead on teaching them how to use services and ultimately create learning opportunities? Of course, the latter is more in tune with the ethos of information and digital literacy, but for librarians faced with harsh daily realities, there is a real tension between the two. The Society of Chief Librarians published a statement, in June 2015, on how public libraries can “help customers navigate their way around the life essential information they seek”, notably with regards to getting the best out of public services. 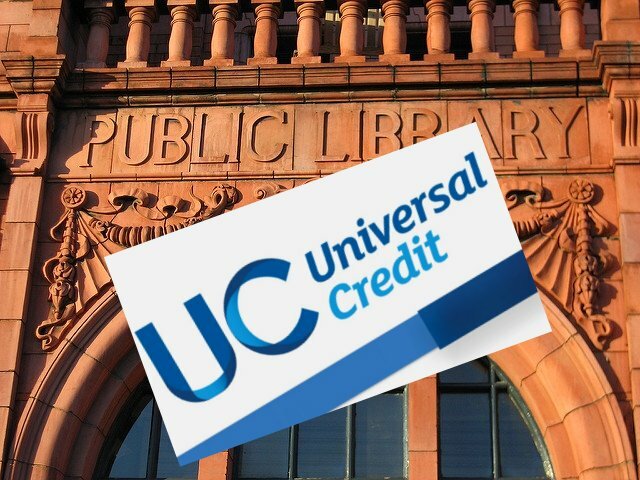 The statement flags up areas where investment and effort are required to achieve this goal, such as strengthening the knowledge of public-facing library staff in areas that include advice on UC, and bolstering the role of volunteers. But there is little in the document to suggest the scale of the difficulties outlined above. Similarly, in 2014, the Local Government Association set out a report on how local authorities were addressing the early introduction of UC. Public libraries are mentioned just once, with regards to ensuring the provision of sufficient computer points for users; nothing there about human resources. That tells me that, at the level of relevant national bodies, the required sense of urgency hasn’t quite materialised – yet.